Kimberly: My name is Kimberly and I write the blog Penny Pincher Fashion. KS: I haven't always loved having naturally curly hair. It took a long time for me to learn how to style my curls correctly and my methods have changed (as have my curls) throughout the years. NC: What is your current hair care routine? KS: I shower at night, apply an anti-frizz/smoothing cream after showering, twist 1/2-inch sections of hair around my finger and let air dry completely. The less I touch it during the drying process, the better. The next day, all I have to do is tousle a bit at the roots, separate the ringlets with my finger, scrunch and go! KS: I mostly wear my hair down when it's curly, but every now and then I'll do a loose bun at the nape of my neck and let a few curls fall around my face. It's my husband's favorite. KS: The biggest challenge for me was finding a product that worked to help separate, define and control frizz. It's hard to find something that does all this and doesn't make your curls crunchy. Right now I'm loving Miss Jessie's Quick Curls, which my friend Grace introduced me to. KS: I don't bother with wrapping it at night. Sometimes I'll twist it into a bun to keep the curls from becoming a tangled mess...but, to be honest, some nights I'm too tired and I just fall asleep with it down! KS: I love the option of having my hair curly or straight. It gives me different looks to play with and my hair holds curl (from a curling iron) better because of the texture it has. NC: How has having curly hair impacted your life? KS: It is awesome in the summertime because I don't have to fight the humidity if I don't want to. I can just skip the blowdrying process and rock my natural curls. It is SO much faster getting ready in the morning! KS: My best advice is to find the right product(s) and process. If you haven't figured out what works best for your curls yet, try a different technique each time and see what brings the best results. 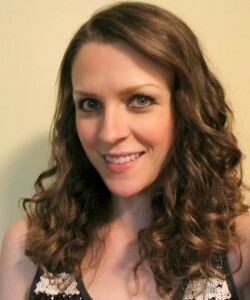 After having two kids, my curls changed and relaxed considerably, so I had to re-learn how to style them. It's all trial and error until you get it right...don't give up! KS: I've been enjoying doing collaborative posts with other bloggers lately and have some great sponsored giveaways coming up soon on the blog! I'm also starting to save my pennies for NYFW and am planning to attend the next Lucky FABB conference to be held that same week.